I have a photo of a bird which we found in Eastbourne. It was on its own and was starving. We gave it a blanket and it slept in there and we left. Trying to work out what bird it is, looks like a duck but even google image search didn't come up with anything! 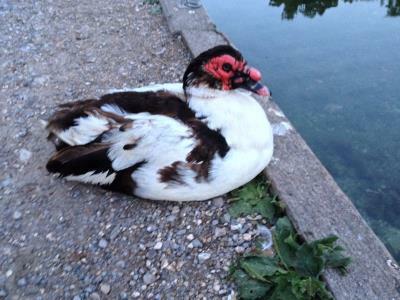 7 Looks like a domestic Muscovy duck.